The Piggy Paint Lollipops and Gumdrops Set is the perfect combination of nail polish for the perfect present! This set contains Jazz It Up (a bright pink shimmer), and Girls Rule! (a bright purple shimmer). Piggy Paint is specially formulated from natural ingredients and dries to a hard, durable finish. This kids nail polish has no toxic chemicals; it’s free of formaldehyde, toluene, phthalates, Bisphenol A, ethyl acetate and acetone. 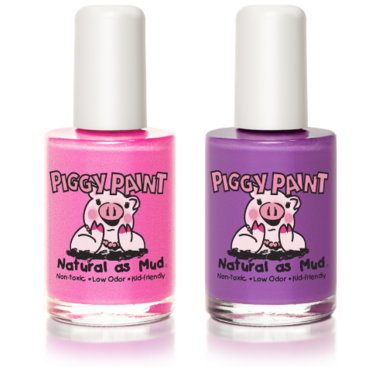 Say good-bye to harsh, smelly chemicals and hello to Piggy Paint…this natural nail polish is as Natural as Mud! Blow dry polished nails for 1 minute with hair dryer set on warm heat/low blower setting. For safety purposes, please follow manufacturer’s instructions on blow dryer and always monitor your child.